When I was on a personal development retreat recently, one of my many favourite things was the boxing moves we did to extremely loud rap music. There was something hugely powerful and energising about it and it’s made me want to find a Boxercise class. In the meantime I listen to the tracks and do the moves in the privacy of my own home. I greatly admire the 2010 exclusive Lutens release Boxeuses (female boxer) although I’m yet to fall in love with it. I keep coming back to it because I find it sophisticated and mysterious, empowering and sensual. As usual the perfumer is Christopher Sheldrake, also as usual, there is no official notes list. However, the consensus seems to be that it contains violet, plum, anise, leather, labdanum and woods. Boxeuses is a fragrance full of violet, plummy goodness with a hint of licorice, underscored by leather. On the face of it, it’s in the vein of Bois de Violette and Faminite de Bois but I don’t find it as intense as either of those other two Lutens creations. In the early stages you’re hit by smoky fumes emanating from underneath the purple fruit and flowers. This is leather that’s been processed to a smooth finish. More chemical than animal. you could mistake it for plastic or vinyl. Violet and plum stop it from becoming that typical dry, masculine style of leather: There’s a reason Boxeuses is written in the feminine form. This is a dark, seductive little number. The fruit is not too stewed, the spice is not too strong and I enjoy the contrast with the smoky leather. However, as it develops it becomes rather too gourmand for my taste. It’s now more about plummy, spiced caramel over woods than it is about leather. The gooey syrup laced with curry spice makes me think of immortelle, which is a tricky note for me. The base is pure labdanum on me; fuzzy, ambery and resinous. Usually Lutens orientals are thick and opaque, but Boxeuses feels surprisingly sheer and intangible. It bobs and weaves, staying light on its feet. It’s everywhere and nowhere. The same way boxers sometimes hold onto one another as if in a awkward embrace when tired, Boxeuses holds on close to the wearer. At the same time it keeps its cool and remains detached, never cosy. Boxeuses is a lesson in how simplicity done well can create the illusion of complexity. You can pick out the components but they combine in a way that is intriguing. I’d like to feel at home in it because the Boxeuses woman is prepared to fight her corner. 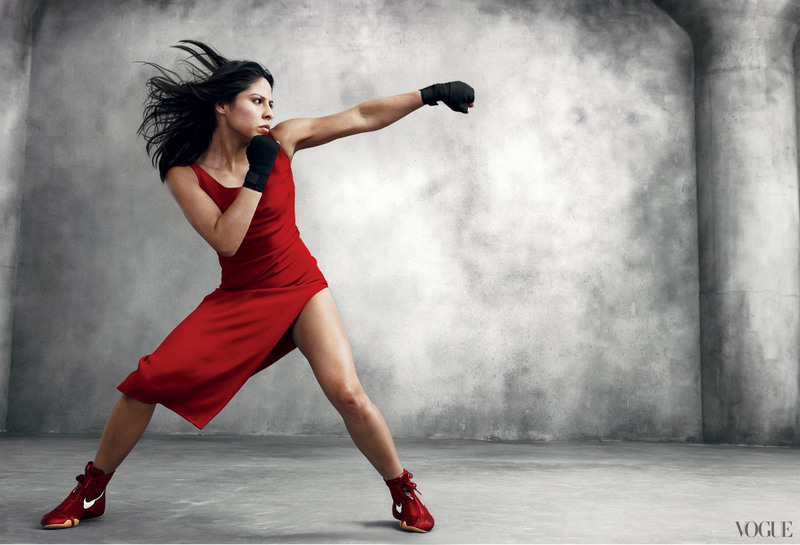 It’s the perfect perfume to wear when you feel like you’re heading into the ring, whether it’s a workplace confrontation (see Undina’s memorable post Round One – I won) or a more personal conflict. Boxeuses will have your back. Beautiful review, Tara. It sums up very much my own feelings with Boxeuses, I want to love it more than I do, this “boxeress”. As with you it’s the immortelle which is tricky, or at least the Lutens’ immortelle 🙂 “more chemical than animal” about the leather is a fun and accurate description. Thanks, Asali. I was interested to read that we’re on the same page with this one. I keep hoping it will click but immortelle can so often push a fragrance over the edge for me and you’re right, particularly the SL brand of immortelle. Wow, what a great gift. I’ve been addicted to spraying but coming out of that now thanks to you. I’ve really noticed the benefits of dabbing when it comes to the bell jars and aldehydes like Vega. Enjoy Boxeuses today. I agree with Asali, great review. 🙂 And it pretty much sums up my ambivalent feelings about this, in theory I love it, but when I wear it I have hard time connecting with it. I love the idea of it and admire it a lot, it’s just yet to work for me. Off to find my sample too to celebrate this feisty review! I particularly love the image of the tired boxers clinging to each other – they do do that, don’t they, and I had never thought how odd it is really. 😉 I shouldn’t love perfumes with licorice, but there are several that get past my radar, Boxeuses included. I am not sorry that the leather is more muted, and while plum can be tricky for me, the light and airy quality of the scent that you evoke keeps everything nicely in check. I must say that I absolutely hate rap music though, so I wouldn’t be joining you in those otherwise very aerobic and invigorating moves! Not helped by the fact that my next-door-neighbour loves rap and used to have it blaring from a ghetto blaster on the patio in the summer. I even heard him singing it through the wall in that kind of ‘white man pretending to be a black man’ Sarf London accent – if you know what I mean. Thanks for prompting this collective wearing! Have Boxeuses on now and the freezing weather is a perfect backdrop for its warm, plummy androgyny. Oh yes, it’s perfect Boxeuses weather today. It makes me happy that you’re wearing it too now. I always thought the heavyweight hugging was odd! Boxeuses is something I associate with Val and never really thought to try it on myself. Maybe this time in Paris I will. Thanks for seeing that in me, Portia and for taking the time to comment on such a tough day for you. I’d love you to try this Paris and write about your thoughts. It’s hard though when you strongly associate a fragrance with a pal. It can be tough to find yourself in it. I’m glad that you found not only Gratitude, but a good fighting spirit. Go, girl! Yes, you never know till it’s on your skin it’s true, but I think Boxeuses could work well for you, Sabine. Great review, Tara. Boxeuses never appealed to me due to iTS name, but I have gotten curious about it, after reading your review. I have a sample somewhere. But, where? Immortelle is a tricky note for me too. Hmm, if you struggle with immortelle it might be a no-go, but if you have a sample – and you can find it! – it’s worth a try. Million Dollar Baby review Tara, thank you. I am curious to smell Boxeuses one day, a good reason to visit Paris I suppose, and I am all for having an inner boxeuse somewhere. Ha! Thanks, Hamamelis. Getting to try this and all the other bell jars is a great excuse for visiting Paris, if one is needed. I went for my18th birthday and would love to go back post-perfumania. Lovely and powerful review, Tara! A while ago when I had a quick smell of Boxeuses, I liked the woody violet facet but disregarded it as it gave out something plasticky. I gave the sample away and now I’m regretting it. Glad you enjoyed it, Yukiko! Yes, there is a definite plasticky vibe to the leather here. I found out there is a Boxercise class at my gym but unfortunately it’s at silly o’clock in the morning. I love Boxeuses, but I wish it were a bit stronger and long-lasting on me. Fortunately I don’t get the plastic note, it’s just a soft sweet leather on me. 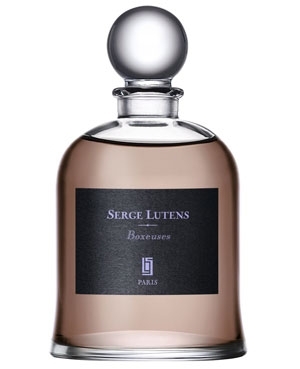 Yes, it doesn’t have the super strength of most of the Serge Lutens line though lasts well on me. Nice to hear that otherwise the leather works so well for you. Loved the review, Tara (and thank you for the link). You chose a good picture for illustration. I will be wearing Boxeuses this Friday (too bad I can’t get that outfit from your picture ;)) and it’ll re-appear in my blog in the next several days, I think. I also noticed that it feels slightly different when applied not from the spray (I had a small roller ball bottle when I tested it). Maybe I should switch back to dabbing it instead of spraying? I would definitely give dabbing another try. I think Val’s right that the SLs work really well dabbed rather than sprayed. I do wonder if that’s the way they’ve been intended to be worn – the export line as well as the exclusives. Spraying is just so quick and you get a big effect quickly. That is interesting, Tara. I never thought of dabbing any SLs. Will give it a try. Do give it a try, Tina and let me know how you get on. It works really well with the exclusives. Can’t wait to see you on the 28th!! !